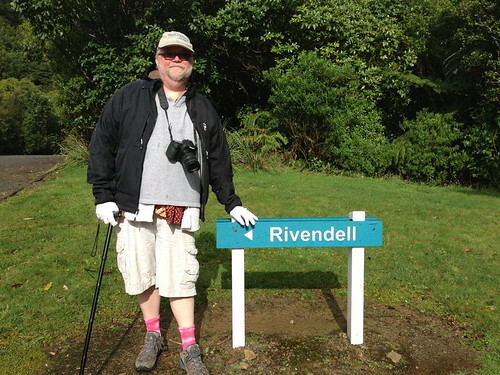 Yesterday we went to Rivendell. After lunch at the home of tyellas, we all went to the Weta Cave, and then enjoyed a tour of the Weta design shops. It was quite something. The day ended with a dinner at the Southern Cross. Lisa Costello, the_child, danjite, khaybee and I were joined by tyellas, her sweetie Richard Self, Sally McLennan and her sweetie Frank Pitt, as well as New Zealand fans June, Kay and Simon. That's strange. In the movies, Rivendell looks all ethereal and peaceful. In this picture, it looks just like Jay Lake. I think you are supposed to go south-east from Rivendell. Let us know if you meet a girl-so-fair in the darkest depths of Mordor. tyellas performed a similar service for me when I visited New Zealand; she's good people. What a wonderful visit, Jay! I can't wait to see more pictures!